PSI is seeking a postdoctoral research scientist to focus on modeling the connections between terrestrial and aquatic ecosystems in Puget Sound. The full job announcement is available below. The Puget Sound Institute, a University of Washington research center located in Tacoma (www.pugetsoundinstitute.org), is seeking a postdoctoral research scientist who focuses on modeling the connections between terrestrial and aquatic ecosystems, especially how the built environment controls the movement of water, nutrients, and chemical contaminants into adjacent surface waters. This position will contribute to our collaborative group by conducting qualitative or quantitative analysis of the connections between land use, stormwater quantity and quality, and the resulting ecological, social and economic endpoints. 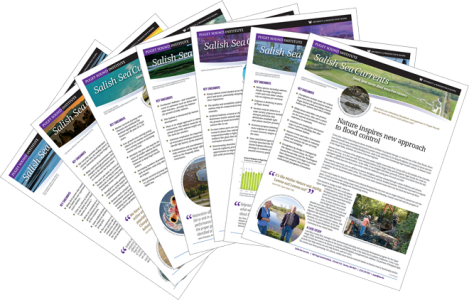 Regional-scale strategies currently being developed to protect and restore critical Puget Sound habitats and ecosystem functions depend on such modeling tools to design smart land use and water management policies for Puget Sound. The successful candidate will hold a doctoral degree in fisheries biology, oceanography, ecology, environmental science/engineering or a related field and will have demonstrated clever and impactful approaches to relating human activities on the landscape to impacts in estuaries. We are especially interested in candidates whose work considers the social and economic benefits and costs of both watershed development and the resulting strategies to mitigate impacts on adjacent waters. Evaluating the linkages between stormwater treatment and social, economic, and ecological endpoints in Puget Sound using qualitative modeling techniques, which could include Bayesian network models, fuzzy logic, quantitative network models (e., “loop analysis”), or other approaches. Developing relatively simple qualitative tools to inform, support, and guide the development of more complex quantitative models that address policy options, including stormwater management options in the Puget Sound region. Coordinating with multiple stakeholders and collaborators to define objectives and research questions, to refine conceptual models, to devise management scenarios, and to interpret and communicate results. Publishing and presenting modeling approaches and results and engaging with other regional, national and international experts. This is a full-time position for at least one and up to three years, depending on funding, beginning in the first quarter of 2019. The successful candidate will be based at the UW Tacoma Center for Urban Waters, will travel regionally to meet with collaborators, and may be eligible work remotely. Interested candidates should provide a short statement of interest, a curriculum vitae, one or more recent publications, and the names of three professional references via e-mail to Joel Baker (jebaker@uw.edu) and apply through the UW Hires portal (https://uwhires.admin.washington.edu/ENG/) Requisition #165198.